This post was inspired by Julianne Moore's well-deserved Emmy (and bright yellow thing) Sunday night. I thought she was phenomenal in late-90's classics Boogie Nights and The Big Lebowski, though she seemed to disappear after taking a run at FBI Special Agent Clarice Starling in Hannibal. But she came back in a big way in the 2012 HBO Original Film Game Change. Her portrayal of a certain Alaskan half-term governor took us inside the meteoric rise to national cult figure, the hubris that came with it, all wrapped in the mind of crazy. 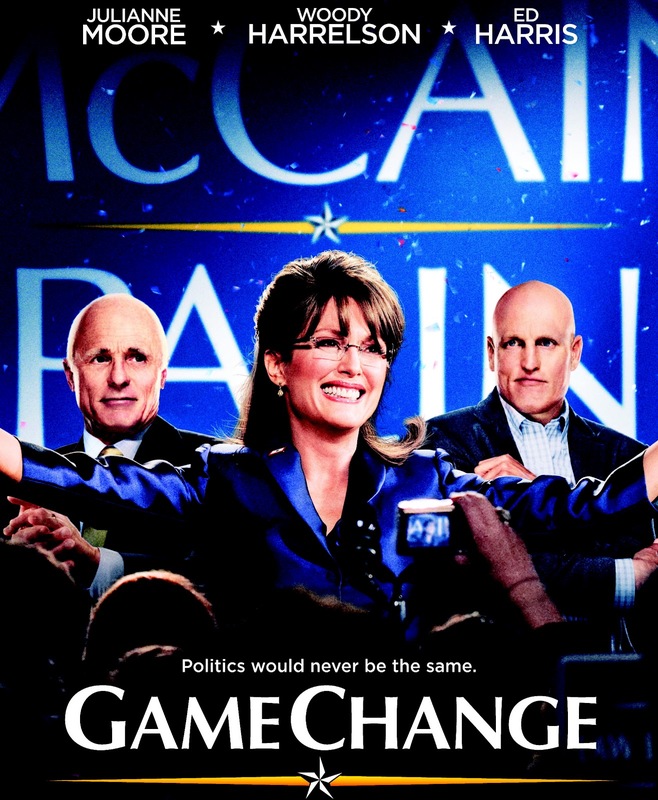 But now more to the point of this post, the book Game Change wasn't really about Palin. 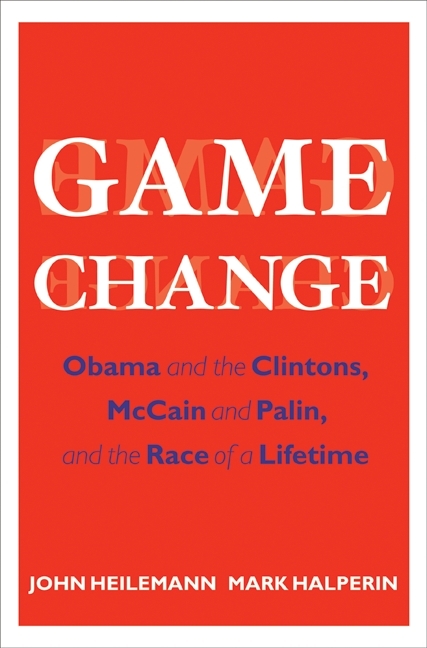 The actual title of John Heilemann and Mark Halperin's work is Game Change: Obama and the Clintons, McCain and Palin, and the Race of a Lifetime. There are 23 chapters in the book, and Sarah Palin is only the subject of two of them. That's only one more than devoted to John Edwards, who was a factor in the Dem race early on. In fact Palin doesn't even enter the story in person (and only mentioned a couple of times before that) until page 359. So why did HBO decide to make a film using just a small subsection of the book by the same name?Well, as the long title of the book hints, the story would be way too broad. So why the McCain/Palin angle? The Obama-Hillary heavyweight fight was just as compelling. And the book's ultimate hero is obvious. In the afterword, the writers state, "And then there is 44. More than any other character, it was Obama who was at the heart of Game Change." It's probably because Obama's American success story is boring in comparison. Palin went from unkown to unavoidable literally overnight. The American reality mentality now is that anyone can be a star, and when they get there we love to see them torn down, built back up, and torn down again. It's the perpetual story arc. In fact America has become so attached to the Palin brand, the supply and demand is there for the whole clan to continue to do reality TV for the foreseeable future. The Palins and the American viewers are co-dependants. Thus the telegenics of a TV movie. The movie seems to check out. The McCain campaign needed a running mate with sizzle to match the heat of Obama, and didn't do their homework on Palin. McCain brain-trusters Steve Schmidt and Nicolle Wallace have backed the story up. Palin's legions feel that she's been scapegoated for the lost 2008 election. Conventional wisdom is that Palin, though an extremely flawed VP candidate, did not lose the election. Chapter 21 of the book is called "September Surprise" in which McCain totally mishandles the financial crisis of 2008. This is glossed over in the movie. Schmidt: [regarding "Troopergate" charges] You can't say you were cleared of all wrongdoing. Schmidt: Because you weren't. The reports stated that you abused your power; that is the OPPOSITE of being cleared of all wrongdoing. Palin: Then why was I told otherwise? Schmidt: You weren't told otherwise! Palin: And why haven't you released a statement saying that Todd was never a member of the Alaskan Independence Party? Schmidt: Because that would be untrue! He WAS a member. Palin: He checked the WRONG BOX! He registered BY ACCIDENT and rectified the error immediately! Schmidt: He was a member for SEVEN YEARS! I'm sorry, Governor, but there is only a few weeks left in this campaign and you have got to stop saying things to the press that are blatantly untrue; that is NOT the kind of campaign that we are running here! Schmidt's role in the movie is definitely outsize in the movie compared to the book, but Woody Harrelson's performance is excellent. He goes from nurturing to placating to puppeteering to excoriating the VP candidate. The movie, as many movies will do to smooth out a story, takes what were likely a dozen meetings among the McCain campaign staff and condensed them into one. That was before Palin's arrival in the movie, and the story seemed incongruous. I'm pretty sure John McCain never said, "Then find me a woman." And I'm sure Rick Davis (Peter MacNicol) never checked a shopping list of every woman in GOP politics against Google articles and You Tube videos. 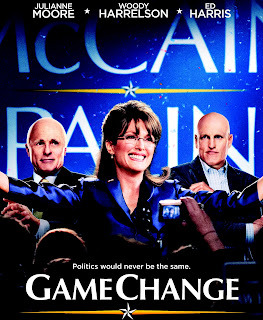 McCain (Ed Harris) is the one who is short-sold in the movie. He's actually the most dynamic character in the book. His legendary temper doesn't come out, and his profanities are kept in check. In the book he's quoted dropping 11 straight F-bombs on poor Cindy after she interrupted him. And his sly humor is invisible as well, "I'm the only one I know who would go to Iraq to get away from it all." In the movie version, McCain comes across less of a maverick and more of a deferential uncle. Also Todd Palin seems too benign in the film. It is well-documented that he was a man behind the curtain in Alaska, manipulating and peddling influence, not a nerdy dad with puppy dog eyes. But Julianne Moore steals the show. She doesn't look like Palin as much as Tina Fey or Gina Gershon, but the nuance is uncanny. The speeches, body language, accent, smile are all spot on. After a little while you forget it's a portrayal. The makeup room meltdown before the Katie Couric interview was chilling. Wallace later said it made her "squirm." I think that people who love the movie and love to hate Palin, might pick up the book and find it's not what they expect. It weaves the tapestry of a 2-year campaign on both sides. The title Game Change actually fits the movie better than the book, even if the movie doesn't have the same mission as the story that spun it.